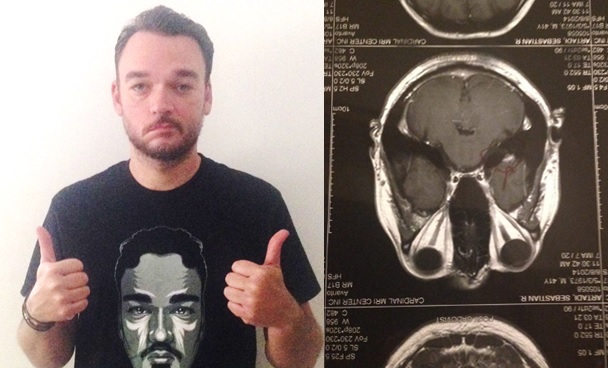 MANILA, Philippines - Filipino rock band Wolfgang’s mestizo vocalist Sebastian “Basti” Artadi is raising funds for a procedure that will temporarily help his medical condition that has left the right side of his face paralyzed. In a viral Facebook post made on Tuesday, June 21, the well-loved Pinoy musician revealed he has been battling a brain tumor diagnosed in 2009. Since he decided not to disclose his condition to the public, several people speculated he had a stroke or Bell’s Palsy. Others accused him of using illegal drugs or being a victim of “kulam” or witchcraft. “I have never and do not take drugs,” Artadi emphasized in his post. According to Artadi, the tumor in his head caused facial paralysis as it is located on the nerves that control the right side of his face. Because of this, Artadi had to relearn to sing with a paralyzed mouth and the fatigue that the condition brings. Moreover, Artadi’s mouth is slowly being pulled to one side since the facial muscles on one side of his face are working more than the other side. Doctors told him that eventually, he will not be able to talk nor sing. “This is why I have decided to do as much as possible in the coming years, singing wise, while I still can,” Artadi wrote. Fortunately, Artadi’s condition may improve if he undergoes a procedure called facial sling. To fund this procedure, Artadi decided to sell shirts that feature a picture of his face. “Its just a picture of my face which I thought would be a good symbol for me getting back the lost symmetry, so no its not because I'm full of myself. I thank God everyday because Im lucky that this thing still left me with the ability to sing, what would have really sucked is if it took 100% of motion from the get go,” Artadi said. If you’re interested to purchase the shirt and help fund Artadi’s treatment, visit Jeepney Stop Rock’s Facebook page or text 09156212189.